In the early 19th century, women who were born to affluent families and who subsequently married “well” could expect lives of comfort in fine homes, catered to by servants. They could expect such things as long as their husbands survived. Quite often a gentleman’s entire estate would pass to his eldest son while sometimes, but not always, allowing his wife to continue living in the house and using his carriage and horses. Just as often the widow was left to the compassion of her family and creditors. Women who months before had worn silk dresses and attended the theatre in pearls found themselves essentially penniless. In 1814, in response to the large amount of needy widows subsequent to the Revolutionary War and the War of 1812, the Association for the Relief of Respectable Aged Indigent Females was founded. Many citizens found the entire concept unfounded. “The alms-house was thought to be the suitable provision for all those who must be supported by charity,” according to a later association report. During its first year the association provided charity to 150 aged females. After two decades of visiting the deprived women in their homes, it became evident that a facility was necessary which could provide shelter as well as medical care. “Nothing short of an asylum where they could be wholly provided for…could meet the urgency of many cases,” an annual report recorded. An Asylum was erected in 1838 that was capable of housing 93 “pensioners.” A long list of applicants was interviewed and should a woman be deemed acceptable she was required to wait until a vacancy was made available by the death of a current inmate. Applicants often waited a year or more before admission. 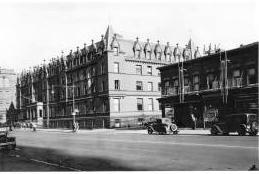 Not until 1881 was action finally taken, when land was purchased at 103rd Street and Amsterdam Avenue (then 10th Avenue) farther uptown where land was less expensive. In 1883 Hunt’s new building was complete; a massive brick and stone French Gothic pile with an cornice serrated by pointed dormers. Completed a year later, the addition seamlessly mimicked Hunt’s original design. The two-story chapel with medieval buttresses and lancet arches featured windows by Tiffany Studios. The Association continued in the building through the 20th Century, remodeling in 1965 to meet new sanitary requirements. Problems arose in 1974, however, when the aging structure failed to meet fire safety codes. 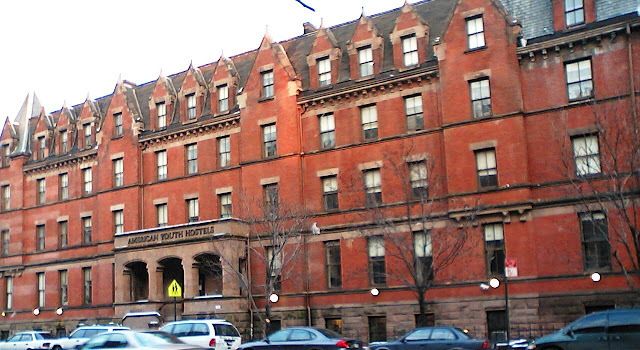 In June of that year plans were announced for its demolition -- of one of Hunt’s few surviving New York buildings -- to be replaced by a modern nursing home. Local residents revolted to the news, calling it a “neighborhood landmark” that could be used by community groups as a “little city hall.” A $9 million loan was sought to save the building. 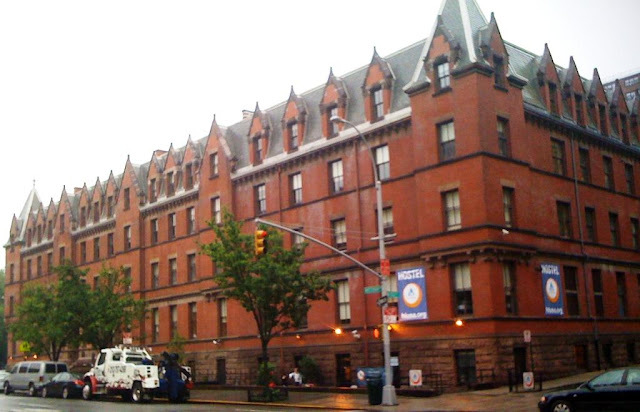 In 1990 a renovation was completed, resulting in New York City’s first youth hostel with “Manhattan’s largest privately owned” garden. Managed by Hostelling International NY, the mammoth structure successfully retains it’s Victorian outward appearance. Approach the building at night and it is a scene from an Edward Gorey drawing – haunting and brooding. In the bright daylight, however, it is a delight of angles and peaks – a remarkable survivor of a bygone era. interesting history...and how urban area addressed the issue of those who otherwise had means but who had fallen on hard times..
That was the original address prior to the renumber of Amsterdam Ave. Thanks. I re-titled the post to clear up any confusion.